Cases of rabies are rare in horses since it is primarily a disease found in wild animals, but a horse can be infected if it is not vaccinated for rabies and is bitten by a rabid animal. The disease is transmitted from the animal's saliva into the bite wound. There is no cure for rabies in horses, and there are no tests available that confirm rabies until an autopsy is performed. Rabies vaccines for horses are available through your vet. Rabies symptoms can be exhibited in numerous ways. 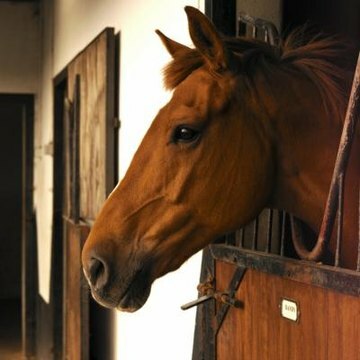 The disease attacks a horse's central nervous system, so neurological symptoms may be one of the first observed. A horse that develops convulsions or paralysis should be seen immediately by a vet. The horse may frantically scratch or chew at the wound where he was bitten by a rabid animal. His coordination will be affected and he may stumble or fall. Initially, a horse infected with rabies may appear listless or quiet. He may refuse to eat. His skin can be sensitive to the touch. He may go lame or drag one leg. He may become very excitable or aggressive. An affected horse can become extremely unstable and attack objects around him. He may drool or salivate excessively. Some horses have difficulty swallowing. Rabies can mimic the symptoms of colic. Rabies can appear to be other illnesses, so immediate diagnosis is difficult. Horses can have a fever, exhibit muscle twitching and incontinence. The onset of symptoms appears quickly and escalates rapidly. Aggression occurs in what is called the "furious" form of rabies. Weakness and depression occur in the "dumb" form of the disease. Rabies is a zoonotic infection, so other animals and humans can be infected by a sick horse. Once clinical symptoms appear, the disease is always fatal. The horse usually dies within one to five days after exhibiting symptoms. Horses that have been vaccinated for rabies are protected from the disease. Rabies vaccinations are recommended by the National Association of State Public Heath Veterinarians and considered a core vaccine by the American Association of Equine Practitioners. Vaccination can be administered to foals at six months of age, with yearly boosters. A horse who has been vaccinated with suspected exposure to rabies should be isolated and revaccinated immediately.